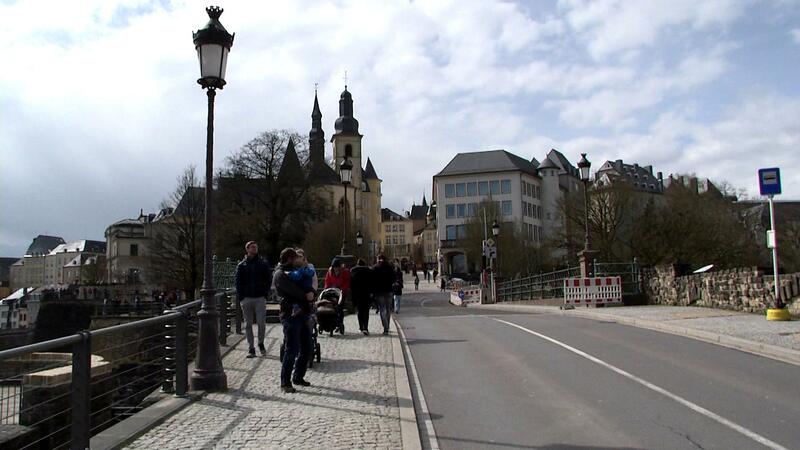 My World Tour Through Luxembourg. Luxembourg is a Grand Duchy. It is not a republic. And it is centrally located in the heart of Europe between Germany, Belgium and France. No wonder, then, that the European idea is deeply rooted here. Schengen is the cradle of borderless Europe. The small winegrowing village was chosen because of its ideal location in the border triangle. The Benelux countries, France and Germany meet here. He's big. He is musically extraordinarily gifted. He draws people under his spell. The "la Lange Veit" plays on his fiddle in Echternach. He never existed, but the legend is a charming explanation of the origin of the Echternach jumping procession. The hiking trails in the Müllerthal lead through intact nature, characterised by meadows and forests. The most striking rocks have been given strange names, such as Piteschkummer, Geyerslay or Hohllay. Wir fahren mit der Grubenbahn zusammen mit den anderen Besuchern auf einer 20-minütigen Fahrt zur Grube. Danach geht es zu Fuß weiter in die Tunnel. Unser Führer erklärt die verschiedenen Techniken des Eisenerzabbaus. If you walk through the capital of the Grand Duchy, you will surely be surprised, because the expectation that there are only banks and offices of the EU here will be disappointed. Instead, however, you will only get to know the attractive reality. It is a small country with about as many inhabitants as Stuttgart and it offers the many possibilities that are expected of a country. And it is not anchored in your head as a tourist destination when you have reached a certain distance from the country. Like it is like this: as a travel journalist the really unknown should also be travelled, not only a new "variation" of the acquaintance. And Luxembourg is something so unknown. Not far enough away to pass for exotic, but so close that the country is known to feel - through news from politics and business. When the project planning has reached the point where the first telephone and personal contacts are made, it becomes clear, at the latest after the first information visit, that one's own feeling has gone in the completely wrong direction, that this is a small country with great opportunities that deserves increased attention!